Herbs is where my passion for gardening first started. I fell in love with the fragrant and tasty little plants growing in the greenhouse where I worked as a floral designer. I knew that someday I would tend an herb garden. I keep a defined herb bed in the kitchen garden, but you will also find herbs tucked all around the garden, among the perennials, pond and Rabbit Run Cottage. Herbs bring bees and butterflies to the garden. Chocolate mint and thyme edge the garden paths releasing it’s fragrance when walking through the garden. Not to mention how much flavor herbs bring to the kitchen. 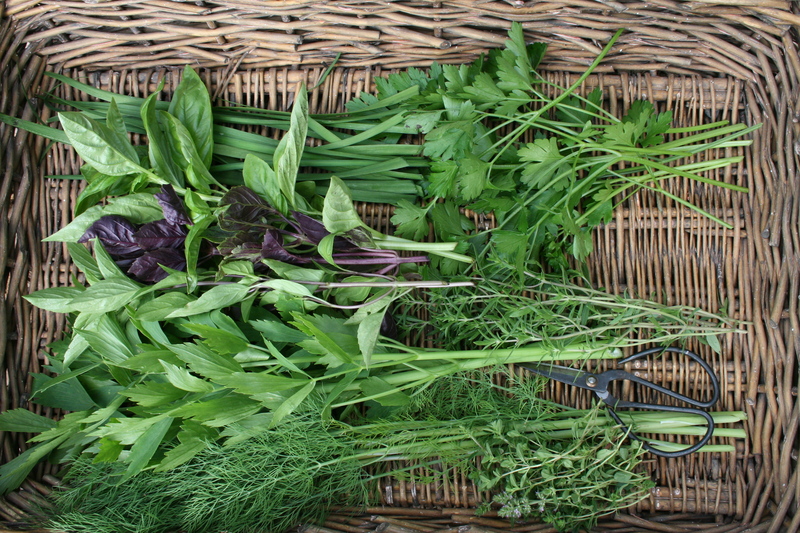 If you have not grown herbs before, consider adding them to your garden this year! I just started growing herbs, basil and oregano, a few years ago. Why did it take me so long? Beautiful image on this winter day. Try thyme….It has been very winter hardy for me. The Winter thyme is my latest favorite. Grows more upright. Once you’ve grown your own fresh herbs, you’ll never go back to supermarket brands. Food comes alive! How I’m missing those Herbs!